1.1 History and Applications of Surfactants. 1.2Market Overview: Importance in Different Industries. 2.1 The Molecular Structure of Surfactants. 2.3 Self Assembled Surfactant Aggregates. 2.4 Adsorption of Surfactants at Surfaces. 3.3 Phase Behaviour of Surfactants. 3.6 Rheology of Surfactant Solutions. 5.5 Poloxyethylene Esters of Fatty Acids. 5.7 Polyalkylene Oxide Block Copolymers. 5.11 Esters of Polyhydric Alcohols and Fatty Acids. 6 Other Types of Surfactants. 7.2 Classification and Labelling of Surfactants. 7.3 European Union New Chemicals Strategy. 8 Relevant Legislation, Australia, Japan and USA. "This book is designed to give practical help to those involved with the use of surface active agents (or surfactants). It is intended particularly for new graduate and post-graduate chemists and chemical engineers at the beginning of their industrial careers and for those who, in later life, become involved with surfactants for the first time. The book is a straightforward and practical survey of the chemistry of surfactants and their uses." 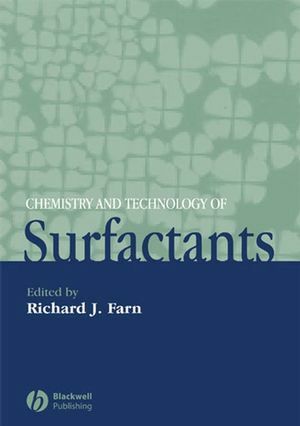 "Every lab needs a book on surfactants and this is a very good one. It is well edited with a uniformity of presentation, well illustrated with excellent tables and diagrams, and well referenced. With a hard cover, robustly bound, and reasonably priced, it is good value." A concise, and accessible overview of the chemistry and technology of surfactants, allowing the reader to acquire, rapidly and economically, a sophisticated working knowledge of surfactants. Highly practical in approach, the book will focus the how surfactants are used in the development of formulated products and in resolving formulation problems, giving the reader clear guidance when faced with these tasks. Primarily written by industrial chemists, the book offers a unique insight into the use of these materials.